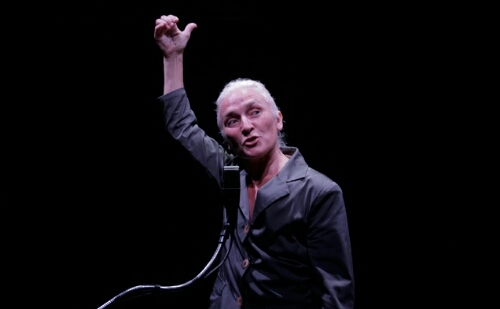 “Riverrun” is the voice of the river in James Joyce‘s “Finnegan’s Wake“, adapted, directed and performed by Olwen Fouéré. Showing at the Sydney Theatre Company, this play is unlike any other. Fouéré embarks on the difficult task of making Joyce comprehensible and through her performance, she does. Don’t expect to come away with a newfound understanding of this literary giant. If anything, this play creates a new way of accessing Joyce, giving life to the sound play of his words. Performed, Joyce’s wordplay seems more digestible, with sounds devices like assonance, alliteration and spoonerisms brought to the forefront. His relentless folly at the nature of language really translates through this one-woman performance. In her adaptation of “Finnegan’s Wake“, Fouéré creates an electric space that plays with the natural dynamics in Joyce’s language. To be completely honest, I didn’t know what was going on for most of the time, because Joyce’s language is that difficult. Yet her performance was so effective that the words began to have meaning. Fouéré is a very expressive actress, she embodies the language and creates the atmosphere, thus helping us to understand the spoken words through her actions. The production team did a fantastic job in supporting Fouéré. The lighting was excellent in complimenting her gesture and monologue, while the sound mimicked the rise and fall of tension, creating mood when I wasn’t even sure if there was any. All these elements added to a very meaningful performance, supporting the monologue which, by itself, would’ve been very difficult to sit through. I’m very glad I saw this performance, I really appreciated the mastery of Fouéré’s adaptation. Witnessing Joyce’s writing not only spoken, but performed, helped me relish the wordplay and experimental nature of some of the hardest literature in the western world.